Although articulated locomotives were a British innovation, and Beyer Peacock built over a thousand of them, only a few Beyer Garrets and narrow gauge Fairlie’s ever saw service in Britain. However, articulated locomotives were quite widely used in other areas of the world, especially where huge amounts of power were required without the loading gauge restrictions of the UK. Mallet locomotives started to appear in America from about 1903. 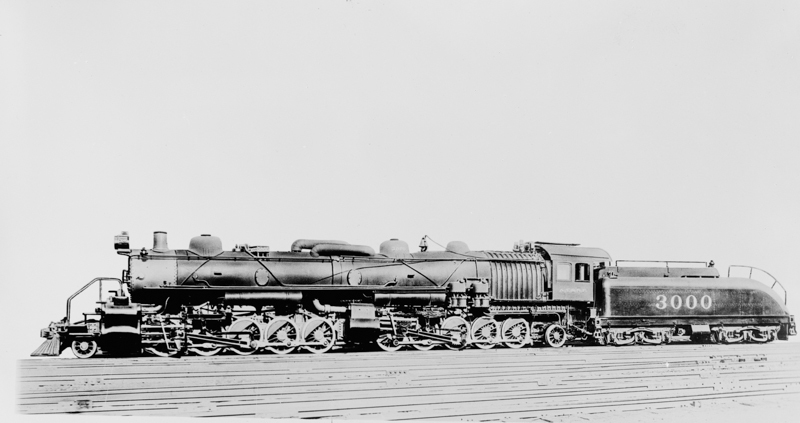 This huge 2-10-10-2 example is as big as an example as you would find, although later examples such as the famous “Big Boys” of the 1940’s were ultimately more powerful as well as being capable of 70mph. Speed was something these early Malletts were not good at, these 3000 series engines being ultimately unsuccessful due to the inability of the boiler to produce steam fast enough. They were relegated to helper status (I think banking locomotives were the British equivalent) before being converted to conventional 2-10-2 locomotives.